NFL Most Valuable Player and four - time Pro Bowl quarterback Boomer Esiason will reprise his role as Feline Football League (FFL) Commissioner. 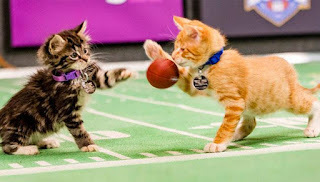 "The Kitten Bowl franchise has become a cultural phenomenon and ratings success where viewers of all ages and demographics can watch and connect," said Bill Abbott, President and CEO, Crown Media Family Networks. "This year’s game will bring unique and innovative content across digital and social platforms that will keep viewers engaged while simultaneously encouraging and educating millions on the importance of animal adoption." The Hallmark channel has released a preview of Kitten Bowl III. Watch below. The Animal Planet will again host the Puppy Bowl. The Puppy Bowl 2016 will begin at 2pm ET on the Animal Planet channel. The Super Bowl 50 will kick off at 6:30pm ET. CBS will though already begin the Pre-Game broadcast before noon.